Gene Hackman has 1 media appearance. A discussion about the novel "Wake of the Perdido Star"
Gene Hackman , Escape from Andersonville: A Novel of the Civil War. SIGNING LINE TICKET EVENT! Signing line tickets are available with the purchase of Gene Hackman's book. to return to save his soldiers. It is a rousing take on familiar territory. The authors will personalize and photography is allowed. Remember your cameras! 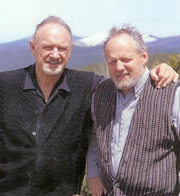 Gene Hackman is currently considered a "single author." If one or more works are by a distinct, homonymous authors, go ahead and split the author. Gene Hackman is composed of 2 names. You can examine and separate out names.